2011 Rose Queen Evanne Elizabeth Friedmann, center, with Princess Tenaya Miyoko Senzaki, left, and Princess Michelle Kaye Washington, join transit officials, civic leaders and members of the L.A. Kimono Club at the Little Tokyo / Arts District Gold Line Station for a ride on the Metro Gold Line to invite parade goers and football fans to Go Metro to the Pasadena New Year’s festivities. Photo by Juan Ocampo. The 2011 Tournament of Roses Queen® and members of the Royal Court visited the Metro Gold Line in the Little Tokyo/Arts District today to encourage the public to utilize Metro Rail to attend the Pasadena Tournament of Roses® as well as all New Year’s celebrations and Rosebowl Game® Presented by VIZIO in Pasadena. Metro will provide 24-hour service on Metro Rail and the Metro Orange Line Dec. 31 in order to accommodate patrons throughout L.A. County who want to attend the Pasadena festivities. Metro also will be providing free rides Dec. 31 on all Metro bus and rail lines from 9 p.m. until 2 a.m. on the morning of Jan. 1. After 2 a.m., regular fares go into effect. Those attending parade festivities after 2 a.m. New Year’s Day can purchase a $1.50 one-way fare if only riding the Metro Gold Line or a $6Metro Day Pass if riding more than one line. The Day Pass allows for unlimited Metro System rides that day. Patrons can purchase their ticket at their initial boarding station. Rose Bowl officials are highly recommending that those attending the 97th Rose Bowl Game® Presented by VIZIO following the parade utilize the Metro Rail System or carpool, as availability of parking is extremely limited in several nearby parking areas due to excessive rains and flooding. Football fans using Metro Rail should travel to the Metro Gold Line Station at Memorial Park. Upon arrival at the station, they should then walk three blocks west on Holly Street to the Parsons Corporation complex to catch the free Rose Bowl Game shuttle bus, with service starting at 10 a.m. The boarding location is on Pasadena Avenue, north of Union Street. Buses will leave continually through the game’s kick-off and first quarter. Officials have increased the number of buses to be used in shuttle service this year, allowing for faster travel times to and from the Rose Bowl buses. Metro is also teaming up with the Tournament of Roses to provide easy access to view the Rose Parade floats after the parade. 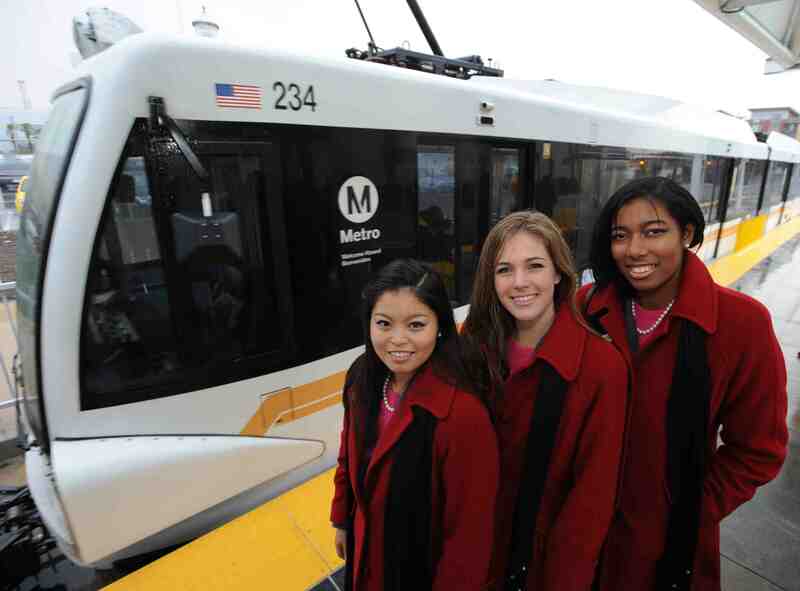 Take the Metro Gold Line to the Sierra Madre Villa Station in East Pasadena. Then board a shuttle bus from the Bus Plaza on the first level of the parking structure that provides direct service to Victory Park, where the floats will be displayed Jan. 1-2. Shuttles will depart from Sierra Madre Villa Station until approximately 3 p.m. each day. Return service to Sierra Madre Villa will continue to 5:30 p.m. Shuttle hours of operation are 12:30 p.m. to 3 p.m. on Jan. 1, and 7 a.m. to 3 p.m. on Jan. 2. On Jan. 2 from 7 a.m. until 9 a.m., only seniors and disabled will be allowed into the viewing area. During the hours of operation the shuttle buses will pick up every five to ten minutes from the station. Regular fares will apply. Metro does not allow eating, drinking or smoking on board Metro trains or buses. To ensure public safety, Metro prohibits flammable products, barbecues and oversized items such as ladders, umbrellas, tents, chairs and coolers from being brought on board the Metro Bus or Rail system. For additional information, visit metro.net. Oooh, I’m excited about the shuttle! A friend had passes to view the floats, and won’t be able to use them… he gave us four of them to take the family. It’ll be soooo much nicer to take Metro than to slog through car traffic! Will the shuttle have a dedicated lane? Or at least avoid the usual parking traffic? Great idea to run the trains 24 hours on NYE! Not to mention the free rides until 2am. Hopefully people will take advantage and we’ll see more of this extended service on Metro Rail on other days. I am coming from Los Alamitos by myself to meet my family at Greenwood and Colorado Blvd.